Fast and Fine Racer!! Want to WIN? This is it!! 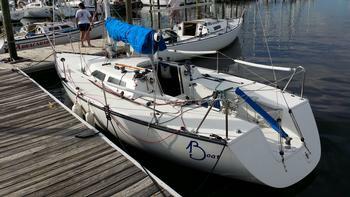 1983 Wavelength 24' Includes; Dual Axle Trailer w/Storage 3 Spinnakers, 2 Mains, 3 Jibs, 1 Blooper, 1 Cruising Main-- All Older but Functional Condition Various Cockpit and Sail Covers Complete Running Rigging Mercury Outboard with Custom Storage Carrier Port-A-Potty and Cooler Carbon Fiber Spinnaker Pole Aluminum Winch Handles New LED Bow Lights Race Ready Rigging Double Foil Track Headstay More Items Call for Info. built by W.D. Schock Corp.
Close up front view on trailer Rear view on trailer Racing on Thursday Night Races!